Osama's dead. I'm happy. Congratulations to President Obama and the United States Military who tracked him down and killed him, making the world a safer place to live. 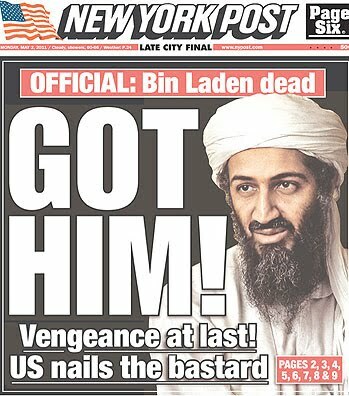 To repeat: Osama bin Ladin is dead. To be a tad cynical for a moment - if this were a conspiracy to boost Obama's poll numbers it was done too early in the election cycle. It's not. Any boost he gets will not last until November 2012. The problem that the Obama Administration has now is not about the release of the photos (I have mixed feelings about those) is that the narrative continues to change. Was Osama armed - or not? Did he use one of his wives as a human shield - or not? Truth be told, it doesn't matter. But what matters is that the story keeps changing - and as a result it takes away from the accomplishment by the military. What irks me most is the question about whether Osama was armed. Does it matter? We know he murdered 3000+ Americans in New York, Washington DC and Pennsylvania as well as bombing the USS Cole and the African Embassies. He was a mass murderer. Mercy shown for a man such as Osama is misplaced to say the least. There was no mercy shown for any of his victims - there should be none shown for him. The fact that those SEALS attacking his compound killed no one unnecessarily shows everyone that this was done with professionalism, the professionalism that comes with being from the military of the United States of America.